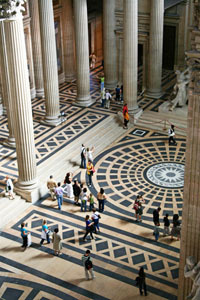 The Panthéon is situated at the top of the Montagne Sainte-Geneviève, in the heart of the Latin Quarter. The first bricks were laid by King Louis XV in 1764. Originally, this monument built by the architect Jacques-Germain Soufflot was to be a church devoted to Saint Geneviève. However, the revolution had other ideas. On April 4, 1791, the National Assembly ordered that the monument should become the Panthéon for well-known personalities who had contributed to the greatness of France. Book your parking place in advance at the Maubert Collège des Bernardins car park or at the Lagrange-Maubert parking to visit the Panthéon. Today, 70 men are buried in the Panthéon’s crypts including Voltaire, Jean-Jacques Rousseau, Victor Hugo, Émile Zola, Léon Gambetta, Jean Jaurès, Victor Schoelcher, Jean Moulin, André Malraux... and one woman : Marie Curie. You are looking to park near the Pantheon ? ParkingsdeParis.com recommends to book in advance your parking place at Maubert Collège des Bernardins car park situated just a 5 minutes walk !